“Just believe”…these two words perhaps single handily have done more harm to the children of our churches than an army of snooty atheists, wielding Bertrand Russell essays. Employed by well-meaning Christians, “just believe” has become the quick solution to all serious theological issues. Have a question about God, the Bible, or life? Ignore it. Take a Kierkegaardian leap of faith and believe. And I’ll be the first to admit that many doctrines such as the doctrine of the trinity, predestination, or of God’s character exceed our tiny limits of comprehension and exploration. and my thoughts than your thoughts. (Isaiah 55:8-9). 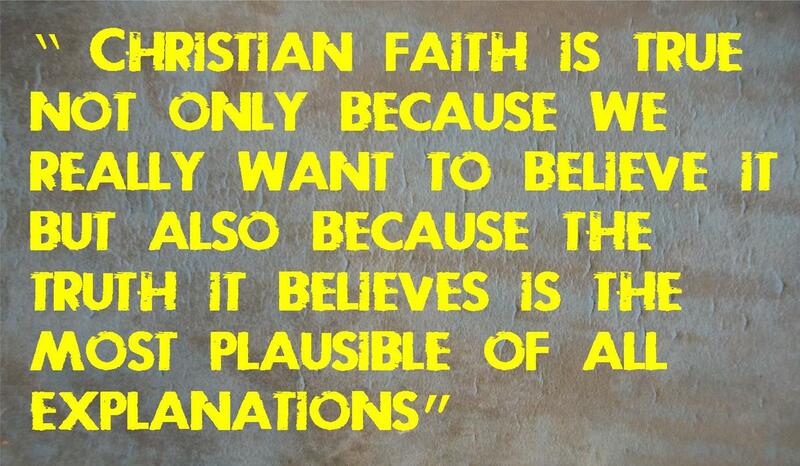 But the fact that God’s thoughts are above us does not mean they are foreign or beyond the scope of reason. God communicated with people through the Bible. “Men spoke from God as they were carried along by the Holy Spirit” (2 Peter 1:21b). God intends for people to understand and comprehend God by using their mental abilities of observation and reason. Peter, Luke, John, and all of the other Biblical writers claimed to be using human language to convey the real events and conversations that comprise God’s message to the world, the gospel (2 Peter 1:16, I John 1:1-5, Luke 1:1-4, Acts 1:1, I Cor 15:1-8). Today, we should help our children take their doubts and concerns about the faith back to the Bible. From my experience, we tend to play the “Have Faith” card because we do not know how to answer our child’s question about, “Why does God let babies die?” Or we are scared that if we do answer the question about the source of evil, we will find the Bible wanting. Friends, we don’t have to be ignorant or scared of the Bible. As one of my favorite writers and professors, Dr. Bruce Ware, often says, “We should never be afraid to ask a question of the Bible.” If we don’t know something, we go investigate. We ask our pastor; we do a word search on Bible Gateway; or we scan our Bible’s concordance. God’s word is beautiful. Yes, the Bible has many hard sayings. It wounds my pride and challenges my assumptions often. And when we devote time to the Bible, we all will be challenged to repent of greed, pride, and a host of other sins. But when we dig down deep into the word of God, we also find true life and comfort (Psalm 119:40, 52)! Although our sinful habits and misconceptions of God might be hurt by the Bible, the ultimate result of our biblical exploration will be an increased faith (Psalm 119:66). And if we don’t help our children work through their questions, someone else will. 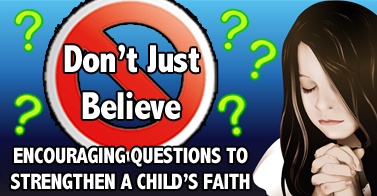 Whether it’s the ever popular agnostic, Dr. Bart Ehrman, or the Darwinian high school teacher, or the local atheist blogger down the street, someone will attempt to answer our children’s questions with skepticism. Sadly by simply appealing to reason, the college professor’s incomplete answers will often appear more compelling than the blind faith our children encounter in many Sunday school classes. While other worldviews employ hidden assumptions, Christianity offers solutions founded upon faith infused reason. As one seminary professor wrote, “Christian faith is true not only because we really want to believe it but also because the truth it believes is the most plausible of all explanations” (Kostenberger, 2014, p. 14). Admittedly, we cannot reason our children to salvation. God saves. But, we can help our children grasp the Bible’s rational worldview, a philosophy more worthy of acceptance than the agnosticism of the blogosphere. The next time a child asks you, “Did Jesus really come back to life?” let’s encourage him to believe by scouring the Bible for a thoughtful answer. And as we wait for questions to boil out our children’s hearts, we can be preparing. We can grab a copy of the Case For Christ, Big Truths for Young Hearts, or Truth Matters. Even better yet, we can pray for wisdom and study our Bibles faithfully. We can begin exploring the words of the one true God daily in personal quiet times and in family worship. We could even venture outside our homes and start an apologetics class at church. Let’s follow the Apostle Peter’s advice and prepare our families to contend for the faith. Keller, T. (2008). The Reason For God: Belief in an Age of Skepticism. New York : Penguin . Kostenberger, A. B. (2014). Truth Matters: Confident Faith in a Confusing World. Nashville: B&H Publishing .